The Spire system in action. 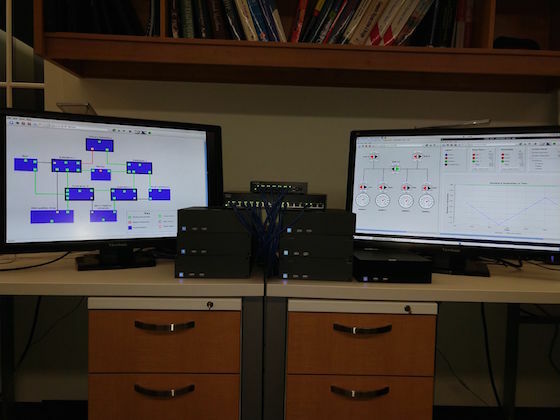 Each of the six computers in the center runs a SCADA Master replica, a Prime daemon, and two Spines daemons. The monitors show three HMIs. One switch connects the replicas to the HMI and a PLC proxy (not shown), while the other is exclusively for communication among the six replicas. There is a hacker-resistant software currently going through field trials in a power plant that is showing promise. The field trial is in a working but currently offline Honolulu power plant, said Johns Hopkins computer security experts. The successful resilience testing, funded by the U.S. Department of Defense, ended up triggered in part by growing concerns about the vulnerability of electric power grids after two high-profile cyber-attacks turned out the lights in parts of Ukraine during the past two years. Neither outage in Ukraine was long or extensive enough to cause serious harm or panic. Yet the attacks served as a wake-up call, putting a spotlight on power grid security in the United States and elsewhere. In an effort to boost resilience, Amir and his team of researchers created an open-source control system for power grids called Spire. The intrusion-tolerant system is designed to keep power flowing even if part of the system is compromised. In an experiment last April, a Sandia National Laboratories hacker team was able to remotely obliterate a commercial grid control system within a couple of hours, but the team could not penetrate the Spire system for three days. On the third day, the Sandia attack team was given remote access to part of Spire, but its test hackers still could not disrupt the system’s correct operation. More recently, the Spire developers from Johns Hopkins were invited for a trial in Hawaii. At the end of January, Amir and his team went to an offline Hawaiian Electric Company (HECO) plant in Honolulu and spent two weeks testing the Spire system on the power plant’s equipment with the help of HECO engineers Keith Webster and John Tica. After a few days of setup and integration, Spire ran continuously without interruption for almost a full week. The goal of the Hawaii deployment was to verify Spire can operate without degrading the control system’s performance and without adverse effects on other power plant systems. On the last day of the Hawaii test, Webster deployed a device to measure end-to-end reaction time of the commercial control system in the plant and of Spire. The measurements showed the commercial system reflected a change in the grid’s power state within 900 milliseconds to one second. Spire showed the same change within 400–500 milliseconds, meeting the timeliness requirement. Part of how the system works is with the help of replicas. The researchers built it to contain six copies of the main control server that work together to agree on updates in the system. That’s the smallest number of replicas needed to get good protection, Amir said. Amir and his colleagues plan to release Spire 1.1, the version that was deployed in this test-deployment, in the coming weeks. Version 1.0, tested in April, is already available for download. Making Spire open-source was kind of a “no-brainer,” Amir said. He has spent over a decade of his research career working on intrusion-tolerant systems and networks. He said that releasing the source code openly increases awareness and the chance for real-life impact. The U.S. power grid is a logical target for major cyberattacks, he said. Disabling or tampering with the grid on a large scale, Amir said, could seriously harm the country by disrupting lives and causing immense economic loss.